The Kohler Tresham K-3950 is a simple, elegant and distinctive toilet. Kohler has a wide variety of toilet designs to choose from, so make sure to check out other Kohler models on this website, before making your final choice. When choosing a toilet that will be in your bathroom for several years, you will want a comfortable, effective and efficient toilet. Does the Kohler Tresham pass the test? Well, hopefully this Kohler Tresham toilet review will answer any questions you may have. Kohler has manufactured many toilets with many different shapes and designs. Some look better than others and it is a personal decision whether you like the look of a toilet or not. Well, the Kohler Tresham has a simple design, almost traditional. Except for the bowl, everything else is either square or rectangle. Even the front of the tank has a square indent design. The handle is placed on the side of the tank and as you can see it is not like a regular horizontal handle, it is vertical. The base of the bowl is thick and solid. It is also a Comfort Height toilet and measures over 17″ from the floor to the seat. This means it is ADA Compliant and suitable for many different users. A Comfort Height toilet’s measurements are similar to a kitchen chair, and a couple of inches taller than a standard toilet. It will be easier for, the elderly, the disabled and people recovering from surgery to use this toilet. Overall, it is a nice looking toilet, with a simple, elegant and solid style. Colors: Almond, Biscuit, Black, Cashmere, Dune, Ice Gray, White. The Kohler Tresham uses AquaPiston technology and gravity to siphon water from the tank to the bowl. Each flush is distributed 360° around the bowl, making sure that the entire bowl gets a thorough cleaning. The AquaPiston canister’s seal material is 90% less exposed compared to a regular 3″ flapper, meaning it is virtually leak proof. This is good to hear, because a two-piece toilet is more prone to leaking compared to a one-piece. Therefore, a leak proof two-piece toilet is definitely a positive. The Kohler Tresham is a leak proof, two-piece toilet. Finally, the Kohler Tresham uses only 1.28 gallons per flush and is WaterSense Certified. The Tresham will use 20% less water compared to a 1.6 GPF toilet. Even more impressive, is that if you are upgrading from an older standard toilet, then you will save roughly 16,500 gallons of water per year, by switching to the Kohler Tresham. This toilet is not only great for the environment but also for saving money on water bills. Only uses 1.28 GPF and is WaterSense Certified. The Kohler Tresham is a two-piece toilet. A two-piece toilet has two separate parts, which is good because when installing, you won’t have to lift a single 100 lbs one-piece toilet. This will make installation easier on your back because you can install the base first and then attach the tank next. Many people may think that you will need a professional to install a toilet, however this is really not the case. A basic toilet should be fine for a person with limited DIY experience to install. I would recommend watching a demonstration video online, to first of all see how easy it is and secondly to see how to install a toilet. It was difficult to find a toilet to match the Tresham’s distinctive look but I was able to find a similar toilet with some great features. The toilet I have chosen is the TOTO Drake II. Both are two-piece, elongated toilets that look nice in their own way. The Kohler Tresham has a traditional square tank with sharp edges. It also has a square indent design in the front. The Drake II also has a square tank, however it is smoother. It doesn’t have any sharp edges and it has a smooth front. I find the Drake II a more modern looking toilet compared to the more traditional looking Tresham. Both toilets are ADA Compliant and will measure over 17″ from floor to seat. 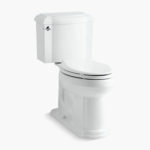 The Tresham is a Kohler Comfort Height toilet, where as the Drake II is a TOTO Universal Height toilet. Both of these toilets will be ideal for anyone that finds it difficult standing up or sitting down because they are taller than a standard toilet. Both toilets are ADA Compliant and are over 2″ taller (from floor to seat) than a standard toilet. Once again both of these toilets are equal for water efficiency. They use 1.28 gallons per flush and of course are WaterSense Certified. The current federal standard requires that all modern toilets use 1.6 GPF or under. Well, these two toilets use 20% less water per flush than that. The Tresham uses Kohler’s AquaPiston technology to provide a highly efficient and powerful flush. It also cleans the bowl a full 360°, each flush. The Drake II uses TOTO’s Dual Cyclone Technology that is also very powerful and effective. Kohler and TOTO are two of the best in the business, therefore you can be sure that their flushing systems will perform very well. Both are WaterSense Certified, using only 1.28 GPF. Neither of these toilets include a toilet seat, so prices are just for the tank and bowl. At the time of writing, the Kohler Tresham was over $50 more expensive. To see the current price, click on the link by the image above. They are a similar price. The Kohler Tresham is just that little bit more expensive. When choosing a toilet, comfort, performance, price and design are taken into consideration. Design preference is a personal decision. You may want a more modern looking toilet like the Drake II or a more traditional looking toilet like the Tresham. These two are equal when it comes to comfort and flushing performance. There isn’t much of a difference in price either. However, according to Amazon customer satisfaction, it appears like there is one clear winner. The Drake II has a lot of very positive reviews on Amazon and is very highly rated. Because of this, the winner for me is the Drake II. If you would like to see a full review on the TOTO Drake II, then follow the link. 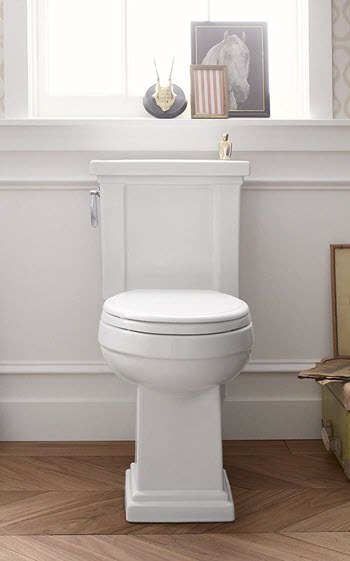 The Kohler Tresham is a traditional and elegant toilet, with a powerful and efficient flush. It is ADA Compliant and WaterSense certified. Its Comfort Height seating makes it ideal for taller individuals and those that find it difficult sitting down on a smaller, standard toilet. It is water efficient using only 1.28 GPF, is eco-friendly and great for saving money on water bills. 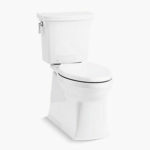 I hope you found this Kohler Tresham toilet review helpful and are able to decide if this model is the ideal toilet for you. If you have ever used the Tresham, let us know what you thought of it. Also, if you have any further questions on the Kohler Tresham or any other Kohler models, leave a message in the comment section below.